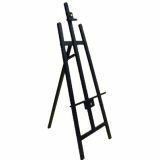 Now that's a mouth full but if you want a do-everything easel this is it. 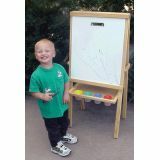 Banks School Supply worked hard to develop a easel that is well built and can be used for a number of classroom needs. Priced for a teachers budget. Just what the teacher asked for! Two sides both with markerboard surface. 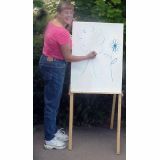 Holds full size chart tablets. Folds for easy storage.